Today almost all of the modified ’33 and ’34 Fords are done up as street rods or traditional hot rods. In the 1940’s and up until the very early 50’s these cars were routinely built as customs. 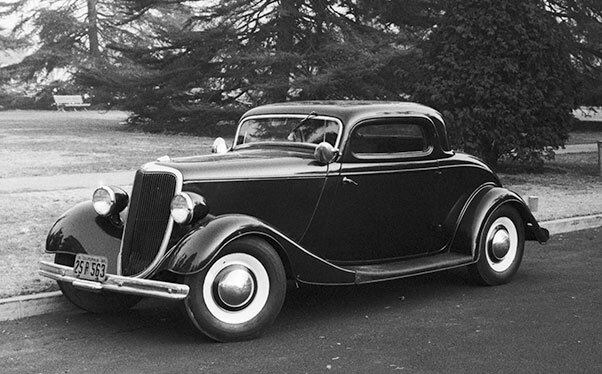 Between these two years of Henry Ford’s popular art deco influenced cars, the 1934 was the hands down favorite as custom material. 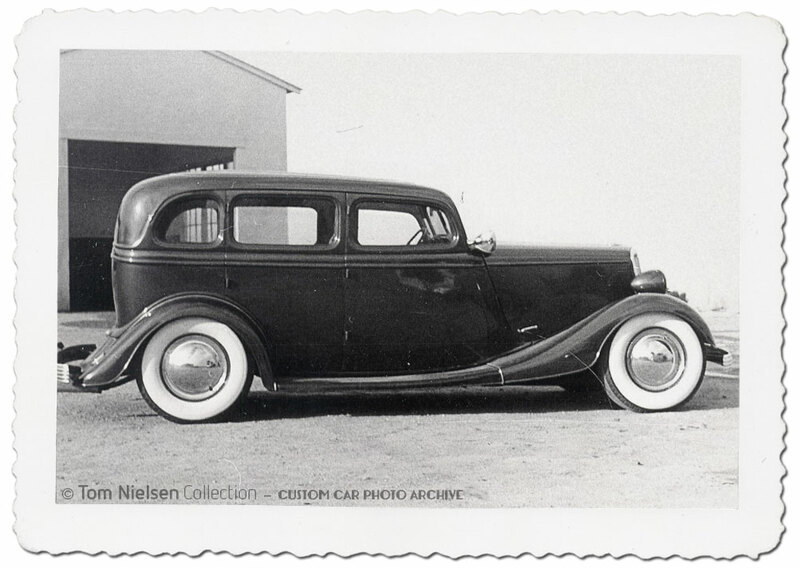 Many ’33 models got a ’34 grille and the two handled ’34 hood as standard operating procedure. It was later when the hot rods got popular that car guys liked the curved bars and thinner grille shell surround of the ’33. Today both years are equally popular and as we know there is a high demand for these good looking and desirable Fords. When they were built as customs, back in the day, the popular body styles were the roadsters, cabriolets, three window coupes and five window coupes. Although not customized as often as the other styles, the sedans, both two and four door, also made very nice customs. Wes Collin’s 1934 Ford Roadster is possibly the best sample of how good the 1933-34 Fords can look customized. The DuVall windshield, padded top, fender skirts, long GM headlights and Lincoln bumpers add an almost movie star elegance to this type of car. 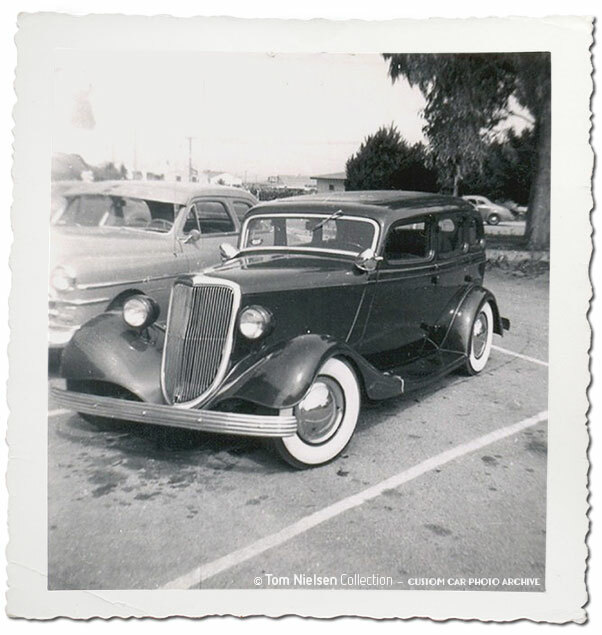 Pat Ganahl did an excellent article on Wes Collins 1934 Ford in the Rodder’s Journal issue 51. 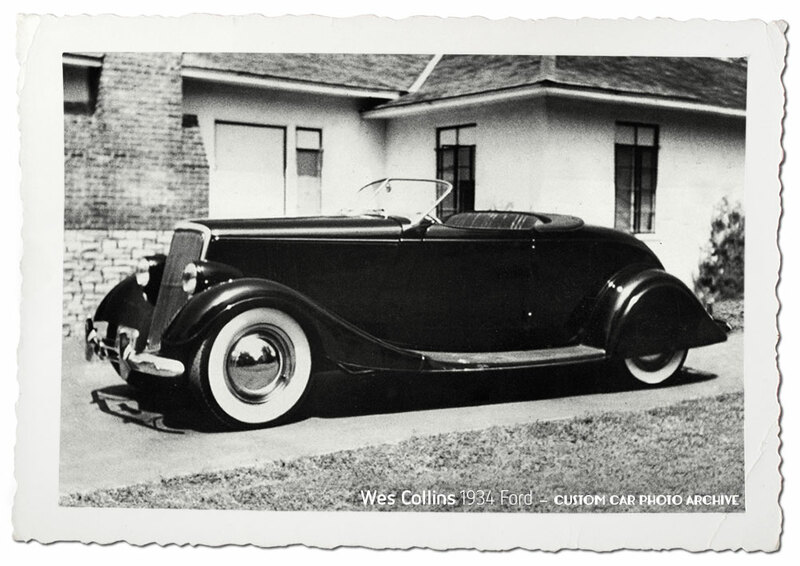 This photo shows Wes’ roadster with a light color, the padded top in place and this photo also shows the George DuVall “swirl” hubcaps. The first order of change in the forties was to get rid of the stock 17” wheels in favor of 15” or 16” solid wheels with flipper hubcaps or other full wheel hubcaps mounted with wide white wall tires, or black walls in the early ’40’s. Headlights, bumpers, and taillights were also routinely changed. Lowering with a slight “speedboat effect” gave the desired look for an early custom. Fender skirts were popular in the forties and aftermarket skirts were available for these cars. This 1934 Ford coupe was chopped, had solid hood sides, Appleton Spotlights, 1941 Ford bumpers and white trim rings to simulate white wall tires. The stance and overall look and feel is all custom. The photo was taken in 1947. Here is the same coupe as above, but now wearing a set of white wall tires and single bar flipper hubcaps. The rest stayed the same, but what a difference in appearance. 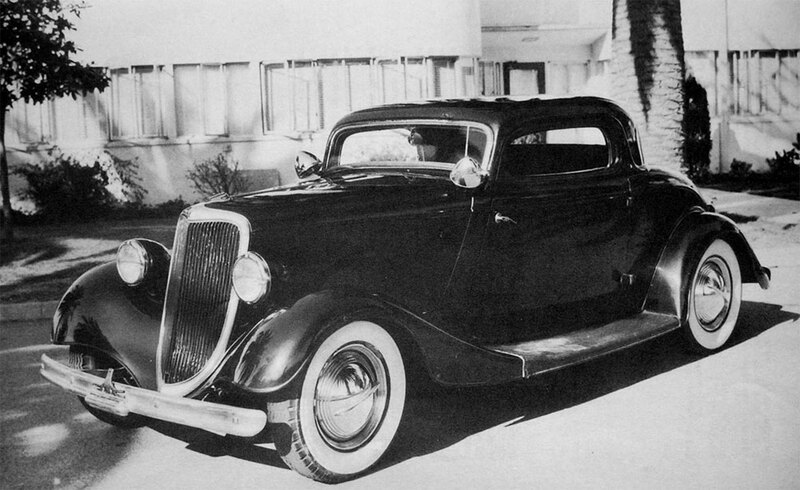 A chopped 5-window coupe with 1936 Ford rear fenders. The taller rear fenders made sure the rear could be lowered a bit more than the stock rear fenders allowed. Appleton spotlights look good on the closed cars of this vintage. In the forties one spotlight on the driver’s side pointed to the rear was common. Later the trend was for dual spotlights turned down in a traditional manner. Body modifications often included filling the deck lid and door handles. Smooth or louvered hood sides gave a cleaner look to the front-end. 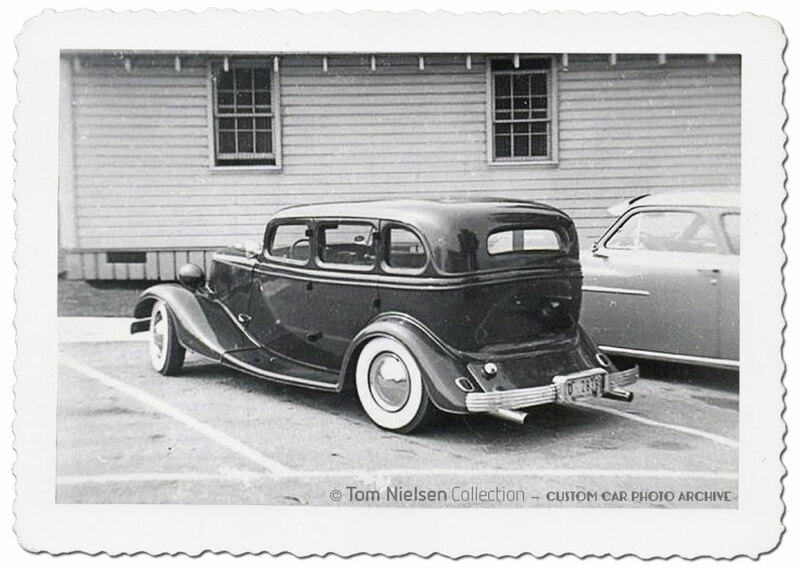 These cars really lend themselves to a chopped top and many closed car ’33-4 Fords were chopped. 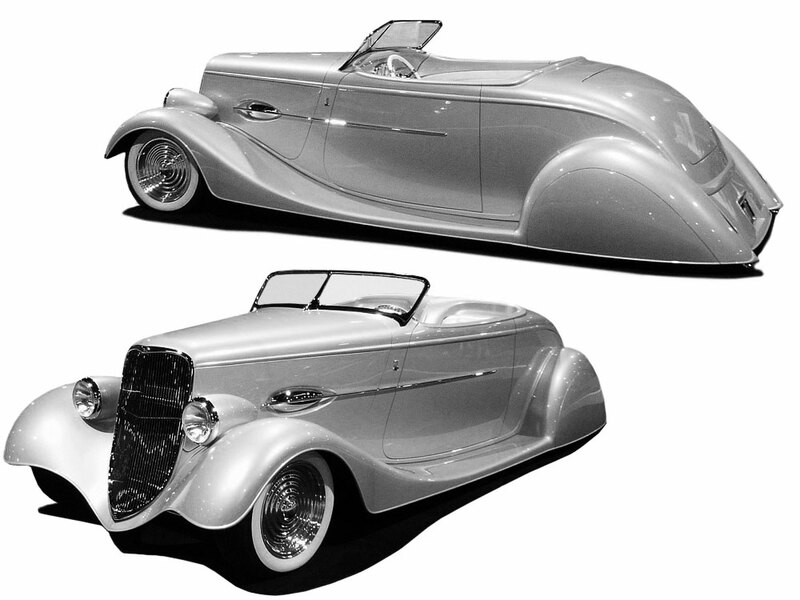 The roadsters would sometimes get a DuVall windshield and the cabriolets a chopped windshield with a Padded Top. 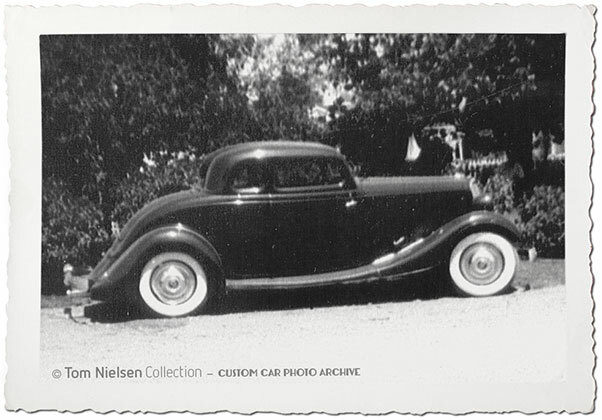 All three photos above show that even 1933-34 four door sedan’s were customized back in the day. This sample is perfectly chopped and restyled by John Dennis. Some of the more radical examples of these customized cars might have been channeled and the running boards were removed when raising the fenders on the body. Sometimes a different grille such as a Brewster was added, but most customizers preferred the ’34 grille. These two years of Fords gave the custom fans lots of options and the results were “easy on the eyes”. Rick Dore reminded us how good they look as customs when he unveiled his mint green ’33-4 roadster a few years ago. Although filled with modern billet parts, Rick Dore’s Ford sure had a full custom feel. He used a set of 1935-36 Ford rear fenders to get the car really low in the rear. 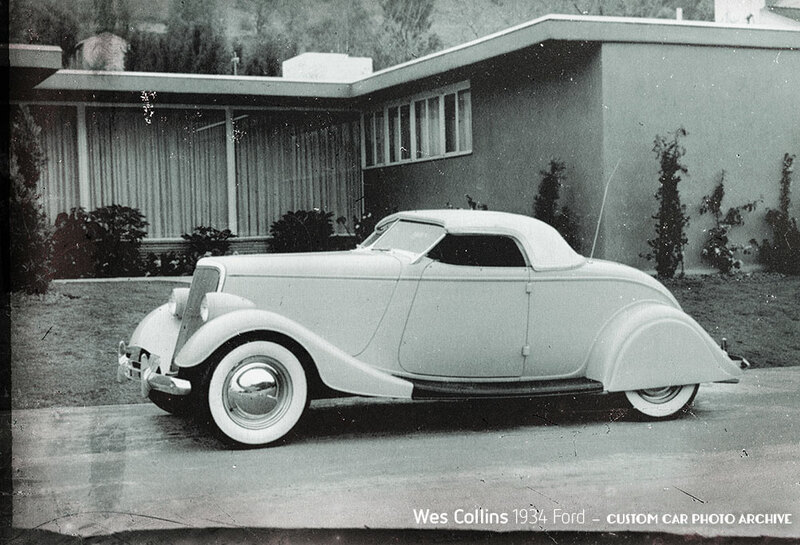 The car was obviously inspired by the Wes Collin’s 1934 Ford Roadster. Hot Rod, Custom or a little of both the ’33 and ’34 Fords definitely have “the look! 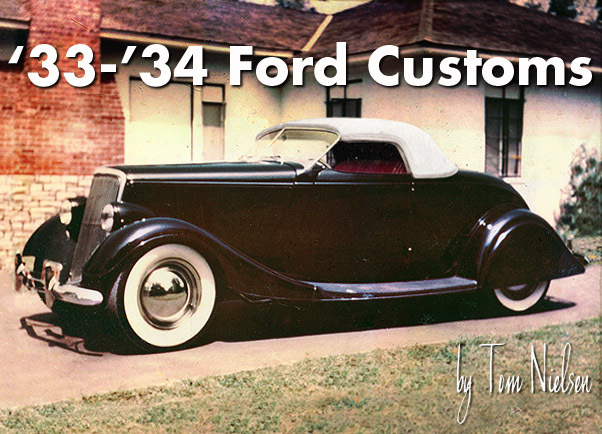 We hope that more of these cars will be built as customs in the future and hopefully this article and images will help some to get motivated building a customized 1933-34 Ford in the near future.